Miguel Cummins bowled Worcestershire to a thrilling victory by 11 runs over Sussex at Hove after claiming 12 wickets in the match. Chris Jordan (50) and David Wiese, who finished unbeaten on 70, put on 114 in 23 overs for the seventh wicket to get Sussex to within 45 runs of their target. Even when Jordan was square up by Cummins and caught behind the ball after reaching his second half-century of the match, Wiese and Jofra Archer added 19 runs to get the target down to 26. Brett D’Oliveira produced a wonderful catch at square leg to intercept Danny Briggs’ leg-side flick and with the next ball Cummins sent middle stump flying as he yorked Steve Magoffin before setting off on a celebratory run around the outfield, with his delighted team-mates in hot pursuit. Sussex were soon 42 for 4 as Cummins bowled Ben Brown with a nip-backer which kept a touch low and Joe Leach collected his 60th wicket of the season when Fynn Hudson-Prentice (20) was bowled. 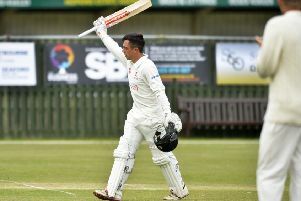 But the green shoots of a Sussex recovery began to sprout in a fifth wicket stand of 54 between Ollie Robinson and Phil Salt, who had started to look at ease until he drove a slower ball from Charlie Morris to mid-off for 17. Their first 50 runs came from just 41 balls and luck seemed to be running Sussex’s way when Jordan’s mis-timed pull off the indefatigable Cummins dropped just short of D’Oliveira at mid-wicket.